← Do countries have friends? People keep talking about the 1960s as if that were the only progressive period in American history. It’s the only one people who weren’t around in the 1930s can recall, and of course people are very conscious now of Bloody Sunday and the voting Rights Act of 1965 because of the 50th anniversary and the movie Selma; but the 1960’s are not the only progressive period in our history or the one with the longest influence. The last 45 years have chipped away at the legacy of the 1960’s, and the US Supreme Court is in the process of demolishing the last important legal vestige of the 1960’s, voting rights. Most of the legacies of the 1930’s, such as worker rights, have slowly dwindled away too, and Social Security has been under threat of diminution and privatization for a long time. It’s discouraging to realize that American society doesn’t really change until people go to jail or die for their rights. In the women’s suffrage movement, the crisis came when women were (unconstitutionally, of course) arrested and packed off to cruel prison conditions, as in “Iron Jawed Angels,” a movie I wrote about in 2013. That movie begins in 1913, two years after an industrial fire in New York City that killed almost 150 women, mostly young immigrants, which galvanized both the American labor movement and the women’s suffrage movement. Tomorrow is the 104th anniversary of the Triangle Factory fire. “The Triangle Fire” on PBS was an amazing documentary in the American Experience series of which you can still buy the DVD for about $20. The film begins with New York City’s tribute to those victims still unidentified a few weeks after the disaster of March 25, 1911. A hundred years later, the last six unidentified victims were finally identified; see more on them and their identification at the Cornell University site The Triangle Factory fire and in “100 Years Later, the Roll of the Dead in a Factory Fire Is Complete,” New York Times, 2/20/11. 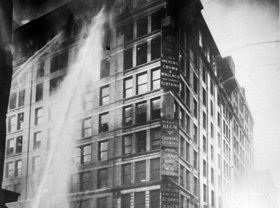 …And so, for the first time, at the centennial commemoration of the fire on March 25 outside the building in Greenwich Village where the Triangle Waist Company occupied the eighth, ninth and 10th floors, the names of all 146 dead will finally be read…. A shirtwaist, by the way, was basically a button-down blouse that was ready-to-wear, fashionable, and symbolic of the growing role of women outside the home, according to PBS (page no longer active). To enter a streetcar, and not eternity…. That’s the sad gist of the story. Here are some further themes from the documentary, from PBS’s Triangle fire home page (no longer active), from “Triangle Shirtwaist Factory fire” in Wikipedia, and from other sources identified above and below. Progressive reformers had been shining a light on the growing inequalities in America for twenty years… But their calls for government to rebalance the relationship between employers and their employees went largely unheeded. Does that sound familiar? And do our current downturn in regulation and decline of the union movement seem like an ironical commentary of the sacrifices and losses of life in 1911? Ironically, the Triangle Factory workers themselves–who were at the forefront of the movement, courageously staying out on strike while they were brutalized by hired thugs and scorned by official New York, and their families went short of food–did not succeed in unionizing their own place of employment. Ironically, the daughter of J. P. Morgan and other “society ladies” and woman suffragists publicly supported the strikers (up to a point) and enlisted socially prominent picketers. Ironically, owners Max Blanck and Isaac Harris had emigrated as young tailors from Europe to the US 20 years earlier; now, their policies caused the deaths of 146 mostly Italian and (like the owners) European Jewish immigrants or their children, almost all of them women, half of them teenagers (the youngest: 14). The owners were acquitted on manslaughter and actually received more in insurance than the cost of the physical damage to the facilities. Ironically, the factory was in the Asch Building (it was not, however, reduced to ash and is now part of NYU). The owners on the 10th floor, notified by telephone from the 8th floor where the fire started, escaped to the roof. But of the 240 workers on the 9th floor, more than half died. There was no fire alarm; one stairway was locked (the foreman escaped to the street with the key in his pocket); the external fire escape collapsed; the freight elevators began to melt and were weighed down by bodies falling down the shafts; fire ladders reached only the 6th floor. Over 50 victims chose death by falling to the sidewalk rather than by being burned up. Things can’t get worse than the Triangle fire, right? Actually, “Deadliest Workplace Accidents” at PBS catalogues 37 other industrial and manufacturing accidents of US facilities. Of those, eight have even higher death tolls than the 1911 disaster, ranging up to 581 in 1947. The Ludlow Massacre was an attack by the Colorado National Guard and Colorado Fuel & Iron Company camp guards on a tent colony of 1,200 striking coal miners and their families at Ludlow, Colorado, on April 20, 1914. Some two dozen people, including women and children, were killed. The chief owner of the mine, John D. Rockefeller, Jr., was widely criticized for the incident…. Surely management-imposed labor disasters don’t happen any more, right? Unfortunately, they do: the PBS list ends with six 21st-century disasters: death in an oil refinery, a sugar refinery, a power plant, two mines, and of course the Deepwater Horizon oil well explosion of April 20, 2010, which killed 11 workers and produced the worst oil spill in U.S. history. It takes a lot of guts to be an industrial worker in the US, doesn’t it? At least we don’t have any more sweatshops, right? As I wrote in 2012 in “Burning up workers,” reflecting on the fire in a Pakistani garment factory that killed twice as many workers as the Triangle fire. “Wrenching events,” in the Times’ expression, happen around us all the time, in fires, mass shootings, car accidents, environmental disasters, wars, and the steady erosion of our social fabric. Will those too have “a profound influence”? Or is our society totally adjusted to such events, as it seems for now to be to the Sandy Hook Elementary School shootings and their almost monthly sequels, as an everyday cost of doing business? Is living among self-generated death and destruction just how it is to be Americans these days? This entry was posted in Labor and tagged progressive movements, Triangle Shirtwaist Factory, women's suffrage, workers' rights. Bookmark the permalink.